These were the highlights of our trip: -the staff was friendly and helpful. -our villa was amazing! Everything was cozy and comfortable. (2 bedrooms 3 baths) -as much as we love the beach, the private pool is a nice... It's very close to the airport. The free breakfast at the Beech House was great (we especially liked the egg rolls, curry, and stew). All I want is a place near Airport with good service and beautiful beach to enjoy before back home, so I booked a room at Duyen Ha Resort. 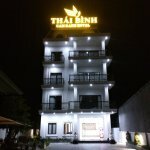 Get quick answers from Thai Binh Cam Ranh Hotel staff and past guests.